The Secret Falls is located on the Kapaa end of the river. Although nicknamed Secret Falls, it’s not at all very secret. It probably got the nickname because it’s difficult to access via land (because of trespassing issues) and must be accessed by kayak. 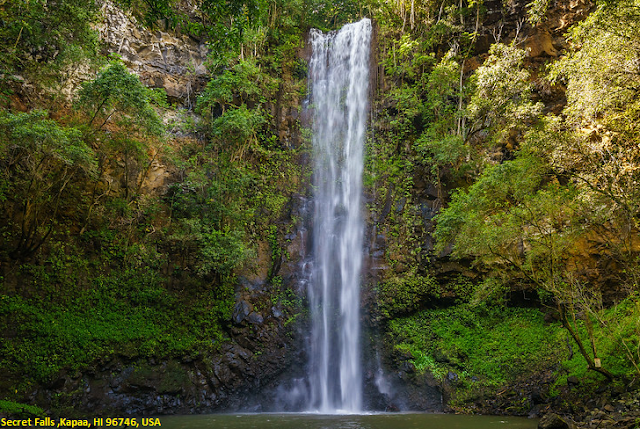 The proper name for this waterfall is Uluwehi Falls (meaning lush and green vegetation). The 100-foot Uluwehi Falls, nicknamed Secret Falls by locals, is one of Kauai’s most popular secrets. However, getting to the falls is not such a secret, if you know how and where to go. The tour is listed as being 4-5 hours long, two hours of paddling (roundtrip), two hours of hiking (roundtrip), and an hour at the falls. Based on our GPS track, the kayak portion did indeed take one-hour (one-way). However, the hike to the falls lasted a very short 30 minutes (one-way). If you’ll be renting a kayak independently, access the river at the boat ramp on Kuamoo Rd. As you turn onto the road from the highway, look for a left turn uphill from the heiau (Hawaiian temple). After about a 30-minute paddle upstream you’ll arrive at the Kamokila Hawaiian Village on the right. Just beyond this point there is a fork off to the left that will take you to Fern Grotto where you can tie your boat off and walk around a bit. Fern Grotto can be enjoyed in about 10 minutes. Afterward, head back down to the confluence and then up the northerly fork. Be careful, as you’ll be paddling through low-hanging hau bushes. About 5 minutes in the river will become quite shallow and you’ll need to pull your kayak off to the right. Be sure to pull it entirely out of the water and secure the paddle, as a bump from another canoe could leave you stranded! Note that is area can become quite busy, especially during the week. After securing your kayak, follow the trail upstream and you’ll soon arrive at the river crossing where you’ll see a long rope. Be very careful when crossing, as people have been swept away and drowned here. A good rule is to not cross if the water is waist deep or higher. If you happen to be on the other side and the river suddenly rises, simply wait for the river level to subside a bit before crossing. Do not risk crossing if you’re not certain it’s safe to do so. After you cross the river, follow the trail upstream for about 15 minutes and enjoy the sights and sounds of the rainforest as you go. Uluwehi Falls is located along a side creek coming in from your left-hand side off the main river.